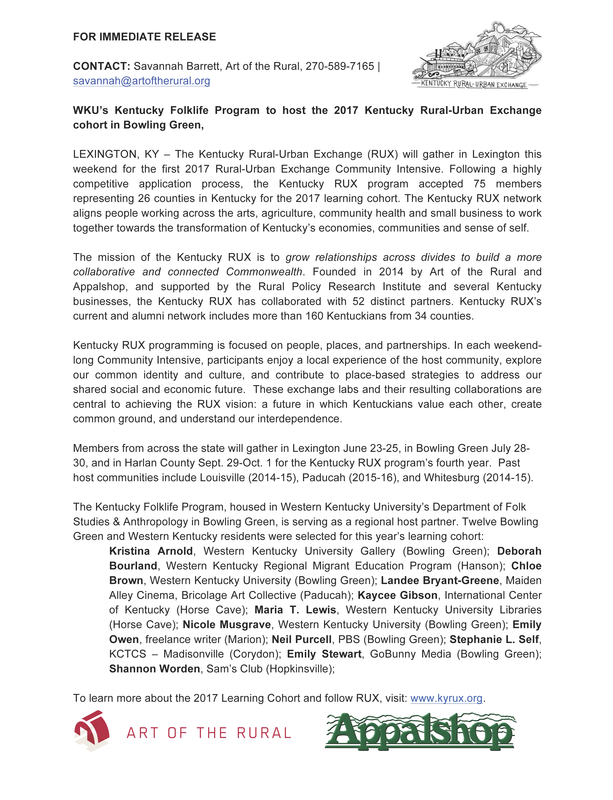 This weekend, the 2017 Kentucky Rural-Urban Exchange (RUX) launches in Lexington, Kentucky. The press release announcing this year’s cohort from the Bowling Green area is below, but you can download the press release PDF here. We are excited to serve as a regional host partner for the Bowling Green weekend which will take place in July. KFP’s Graduate Assistant, Nicole Musgrave, is this year’s intern for RUX. Nicole be sharing photos and updates from this weekend’s happenings, so make sure to check in for the latest from #kyrux2017 and #kyfolklife. You can also follow us on our Instagram account @kyfolklife. LEXINGTON, KY – The Kentucky Rural-Urban Exchange (RUX) will gather in Lexington this weekend for the first 2017 Rural-Urban Exchange Community Intensive. Following a highly competitive application process, the Kentucky RUX program accepted 75 members representing 26 counties in Kentucky for the 2017 learning cohort. The Kentucky RUX network aligns people working across the arts, agriculture, community health and small business to work together towards the transformation of Kentucky’s economies, communities and sense of self. The mission of the Kentucky RUX is to grow relationships across divides to build a more collaborative and connected Commonwealth. Founded in 2014 by Art of the Rural and Appalshop, and supported by the Rural Policy Research Institute and several Kentucky businesses, the Kentucky RUX has collaborated with 52 distinct partners. Kentucky RUX’s current and alumni network includes more than 160 Kentuckians from 34 counties. Kentucky RUX programming is focused on people, places, and partnerships. In each weekend-long Community Intensive, participants enjoy a local experience of the host community, explore our common identity and culture, and contribute to place-based strategies to address our shared social and economic future. These exchange labs and their resulting collaborations are central to achieving the RUX vision: a future in which Kentuckians value each other, create common ground, and understand our interdependence. Members from across the state will gather in Lexington June 23-25, in Bowling Green July 28-30, and in Harlan County Sept. 29-Oct. 1 for the Kentucky RUX program’s fourth year. Past host communities include Louisville (2014-15), Paducah (2015-16), and Whitesburg (2014-15). To learn more about the 2017 Learning Cohort and follow RUX, visit: www.kyrux.org. Kentucky Rural-Urban Exchange Steering Committee Members: Alexia Ault – Higher Ground at Southeast Community and Technical College (Harlan), Ada Smith – Appalshop (Whitesburg), Savannah Barrett – Art of the Rural (Louisville), Shane Barton – UK Appalachian Center (Lexington), Ivy Brashear – MACED (Berea), Landee Bryant Greene – Maiden Alley Cinema (Paducah), Nick Covault – Kentucky Governor’s School for the Arts (Louisville), Stefani Dahl – Norton Healthcare (Louisville), Mark Kidd – Handbarrow (Whitesburg), Josh May (Whitesburg), Cheyenne Mize – STRIVE (Louisville), Sarah Schmitt – Kentucky Arts Council (Frankfort), Gerry Seavo James – The Explore Kentucky Initiative (Frankfort), Ashley Smith – The Lyric Theatre and Cultural Arts Center (Lexington), Richard Young – Community Development Consultant (Lexington). 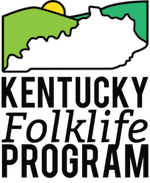 2017 Kentucky RUX Regional Host Partners: The Lyric Theatre and Cultural Arts Center in Lexington, The Kentucky Folklife Program in Bowling Green, and Higher Ground at Southeast Kentucky Community and Technical College and Pine Mountain Settlement School in Harlan.